The all-new Vogue Midi represents the next generation of electric stoves, with stunning LED flame and lighting effects coupled with an interchangeable fuel bed. Following on from the success of the Vogue solid fuel and gas stove ranges, completing the offering is the all-new Vogue Midi Electric! Offering sophisticated, modern-traditional styling, featuring Gazco’s ChromaLight Immersive LED technology, this advanced stove has independent flame and ember bed lighting effects to create the perfect ambience in virtually any part of the home. 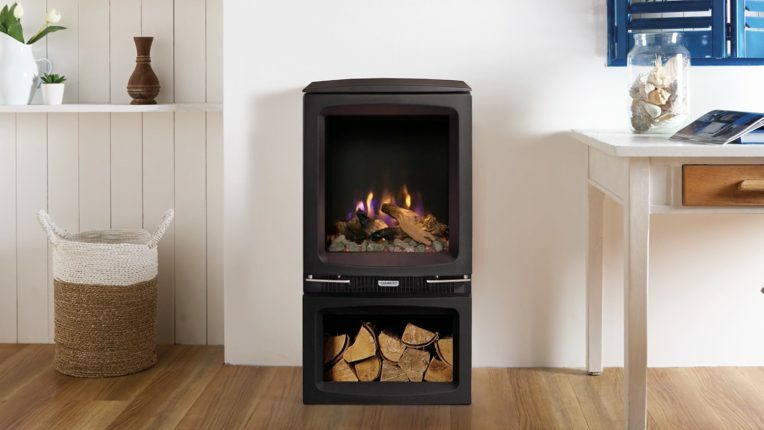 The Vogue Electric is offered in two models including a Midline log store version, which can be stacked with logs to add to the authentic wood fire display. A choice of fuel beds are included; realistic logs, clear and grey pebbles and a contemporary Crystal Ice-effect, which when combined with the range of colour changing lighting options can create a truly bespoke display. Get in touch to find out more, or pop into our showroom to explore our full range.